Why She's Amazing: Although Stadler is only 26, she's already cooked in top French kitchens and launched a buzzed-about supper club in China. 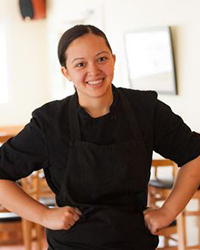 Now she masterminds an outstanding, Asian-inspired small-plates restaurant in Brunswick, ME. Quintessential Dish: Grandma Tang's roast pork buns, a regularly occurring item on the often-changing menu. Culinary School: Le Cordon Bleu, Paris. Restaurant CV: 12 Chairs, Laris, Shanghai; Gordon Ramsay au Trianon, Versailles, France. A Family Affair: For eight months, Stadler and her mother, Cecile, whose parents are from Shanghai, ran a dining club in Beijing called Gourmet Underground. Now the two co-own Tao Yuan, where Cecile is the business manager. Found Ingredients: One of Stadler's hallmarks is using seasonal ingredients in unexpected ways. In spring, she serves calamari with local fiddlehead ferns pickled with Sichuan peppers. Homegrown: Stadler has plans to build an aquaponic greenhouse next to Tao Yuan, combining aquaculture (raising freshwater fish, crustaceans and mollusks in tanks) with hydroponics (cultivating plants in water). Why She's Amazing: Because at age 26, having already cooked for years in Europe and the Far East, she's opened an insanely good Asian-inspired small-plates restaurant in coastal Maine. A Family Affair: For eight months, Stadler and her mother, Cecile, whose parents are from Shanghai, ran Gourmet Underground, a dining club in Beijing. Now the two co-own Tao Yuan, where Cecile is the business manager. Found Ingredients: One of Stadler's hallmarks is using what's on hand and in season. For example, she smokes duck for a buckwheat noodle dish "over a mix of Maine hardwoods—basically, whatever my dad and I dragged out of the forest," she says. In spring, she serves calamari with local fiddlehead ferns pickled with Sichuan peppers. Home Grown: Stadler has plans to build an aquaponic greenhouse next to Tao Yuan. Combining aquaculture—raising freshwater fish, crustaceans and mollusks in tanks—with hydroponics (cultivating plants in water), it "will allow us to have fresh greens all year," says the chef, adding, "I want to have a yuzu tree, a kaffir lime tree, water chestnuts, water oat shoots, four-sided beans—weird vegetables."